We’re always trying to think of ways to shade and catch the beautiful sunshine that streams directly through the Art Studio’s wall of south-facing windows in the cold months. 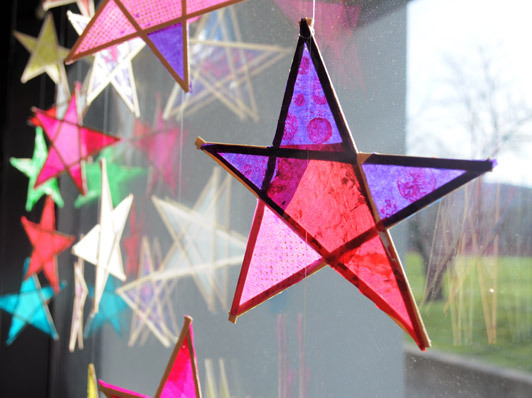 Inspired by the array of twig stars I’ve seen on Pinterest, staff in the Art Studio helped me make these stained-glass-like stars and turn them into a happy window hanging. First, we made the stars’ forms with wooden coffee stirrers and tacky white glue. One of our staff liked using one of the stirrers to apply the glue. If you try this at home you might want to work on a plastic placemat to reduce the likelihood of the stars sticking permanently to your work surface. After the stars dried, we glued them to tissue paper, tracing paper, and Folia Transparent Paper. Some of us used a glue stick, others used white glue. Which is better? In the long run, white glue is always more durable, but glue sticks are easier to use. If you try this, experiment to see which is better for you! After the stars dried on the paper, we trimmed the paper as close to the wood as we possible. The stars that have multiple colors were made by gluing just one of the star’s arms to the tissue paper, cutting it out when it dried, and then repeating for the other arms. One of our staff members liked the effect created by folding some of the excess paper toward the middle of the stars’ arms. As it turns out, folding the excess paper is easier than cutting it close to the wood. To hang the stars, we first put a piece of clear tape on the back of one of the points. The tape gives the paper a little strength so that it wouldn’t rip when strung together. We threaded a needle with a long piece of fishing line, sent it through the taped point almost to the end of the line, and then tied a small knot around the intersection of the wooden sticks to hold it in place. Then, we sent the needle through the point of another star and knotted it in place so that it would hang somewhere above the bottom star. Repeating this process, we strung multiple stars to each line and ended up with 7 lines that have 3-4 stars each. Finally, we wound and taped the lines to a tension curtain rod hung in the window. The stars could be hung in other ways too: across a line like bunting, around a form such as an embroidery hoop to make a chandelier. Ask your children for their ideas! To make this a more open-ended exploration, try offering your children tissue paper or Folia Transparent Paper, wooden coffee stirrers, glue and the question: “What can you make with these materials?” Maybe they’ll be inspired to make stars, or maybe something else! We facilitate a variety of programs within the Art Studio for a wide range of age groups. Please carefully consider the age appropriateness of each individual activity in your own learning environment. Our projects are always done with adult supervision and proper safety precautions. Be sure all of your projects are overseen by adults who likewise follow proper safety precautions. The adults overseeing your project must also be responsible for handling or assisting with any potentially harmful equipment or materials. The Eric Carle Museum of Picture Book Art is not responsible for any damages, injuries or liabilities that result from any activities contained within this website, and we expressly disclaim any responsibility or liability therefor. From time to time, we reference materials that we have found to be particularly important in our projects. We do not receive any monetary compensation for recommending materials. This entry was posted on Wednesday, December 17th, 2014 at 3:01 pm and is filed under By Meghan Burch, Displays & Window Shades, Found Materials, Light, Mixed Media, Paper, Sculpture. You can follow any responses to this entry through the RSS 2.0 feed. You can leave a response, or trackback from your own site. i love this! More ideas to harness light, please! Thanks so much Patty. We'll certainly be doing more light-based installations, so stay tuned! Very Pretty! Easy 4 kids. I can't find wooden coffee stir sticks...do you happen to know how long and wide they are so that i can try to find something similar? Thanks. Hi Terisa, The length we have is 5" and they are about 1/4" wide and no more than about 1/16" thick. Have you tried popsicle sticks? I might also experiment with strips of chipboard.